York University anthropology professors organized a workshop recently to examine how Indigenous knowledge transforms research. The Ethics in Indigenous Research Workshop, run by Professors Christianne Stephens and Naomi Adelson, was hosted at the Native Canadian Centre of Toronto. It brought together Indigenous and non-Indigenous scholars, faculty, and undergraduate and graduate students to discuss ethics and responsibilities when conducting research in and with Indigenous communities. The goal of the workshop was to create a safe space where researchers at various levels of experience could come together to think about and actively engage with thought-provoking ethical issues in diverse areas of Indigenous research. It was developed on the premise that incorporating Indigenous knowledge and values at every stage of the research process transforms the ways in which ethical research is defined, articulated, regulated and operationalized. Organizers were thrilled with the response to the event, which surpassed its original goal of 40 participants. Some of these questions address how to effectively decolonize ethics protocols and Indigenize research paradigms and toolkits; how to develop productive research spaces where Indigenous and non-Indigenous colleagues collaborate and engage in respectful, meaningful and equitable relationships; how to balance community priorities with Indigenous research principles; what it means to be a good ally; what are the ethical challenges facing advocate and activist scholars who pursue social justice research; and how to move forward together to develop strategies and best practices for navigating the real-world research contexts. 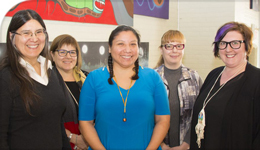 The event, which took place March 16, opened with a prayer and welcome from Amy Desjarlais, guest knowledge keeper, author, research scholar and member of the Elders on Campus program that is available through York University’s Centre for Aboriginal Student Services. “Allies need to take on more leadership roles, where established best practices and successful working partnerships with Indigenous communities is concerned, so Indigenous communities are not always the ones educating the public and creating awareness of issues,” said Desjarlais. The workshop provided a forum for participants to broach their own questions, such as how to address inequities or silences in the research setting and what qualifies as valuable research, among other topics. “The issues surrounding the evolving nature of research ethics in a post-TRC environment are central to the promotion of and engagement with the highest standard of research practices and this event and its associated media – website, resources document, networking opportunities – will positively strengthen and continue to build on our profile in critically engaged research with Indigenous peoples and communities,” said Stephens. Organizers believe they were able to meet their workshop goals. The Ethics in Indigenous Research Workshop was funded by the provost’s Indigenizing the Academy Initiative, the Office of the Vice-President Research and Innovation (Events Fund), the Faculty of Liberal Arts & Professional Studies (Research Events Fund) and the Department of Anthropology, York University.